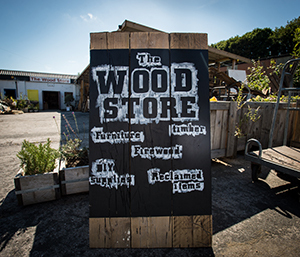 Brighton and Hove Wood Recycling Project (also known as The Wood Store Brighton) was set up in 1998 by Richard Mehmed, who was looking for discarded waste wood with which to make his daughter a playhouse. Fed up with seeing so much potentially usable wood in skips (and heading off for landfill, which was the only option then), he set up the not for profit environmental group with the simple aim of trying to find a more sustainable use for this perfectly reusable resource! It was the first one in the country and has always been financially self-supporting. Richard Mehmed went on to found the NCWRP and apply the model to 25 other sites across the country. Brighton and Hove Wood Recycling Project has received a number of awards and accolades for its achievements and remains a model example of the success a wood recycling enterprise can achieve. Wood recyclers work with local people to save resources, and Christmas is a great opportunity to get young people involved. Brighton and Hove Wood Recycling Project has been shortlisted for the 2016 P.E.A. (People. Environment. Achievement.) Awards, the UK’s leading sustainability awards, honouring the individuals and teams behind ecological business. A beautiful day at last Sunday’s Firle Vintage Fair, and a chance to see wood saved by Brighton & Hove Wood Recycling Project put to great use to make a stage! The grand opening of Brighton and Hove Wood Recycling Project’s new Woodstore took place on Saturday, with marmalade cake and reclaimed wood aplenty.